Today, Lauridsen is the director of access technology at Lighthouse for the Blind and Visually Impaired in San Francisco. We spoke with her and several other individuals who identify as people with disabilities to learn more about how the internet has affected their lives on the 30th anniversary of the World Wide Web. While not the internet itself, the web is the system of pages connected by hyperlinks that has become largely synonymous with going online, and which was first proposed in March of 1989 by Tim Berners-Lee. That makes the web older than Yahoo or AOL or even, dear reader, me. Depending on how you’re counting, Berners-Lee’s proposal is even older than the American with Disabilities Act (ADA), the landmark civil rights bill signed into law in 1990. In the early ‘90s, the web hardly looked the way it does today. It was far more static and much less searchable, but it was, for many people, the first time they were able to connect with a total stranger thousands of miles away—someone who might have a lot more in common with them than anyone they’d met in person before. It also presented a glimmer of the lifestyle many of us are all too familiar with now, one that grants you access to nearly anything imaginable through just a few keystrokes. It’s easy to take this accessibility for granted when it’s all you’ve known. But for many early internet users, the web promised something far more indispensable than simple convenience. Nicolas Steenhout, a speaker and consultant on web accessibility and disability inclusion in his early 50s, said that for him, “one of the most vivid memories of that thinking of, ‘Hey, the web really is going to change people’s lives’” was when one of the first online grocery delivery services, Peapod, launched its website in the late ‘90s. Steenhout is a wheelchair user, but he said he had a colleague who was blind. This colleague said that when he went grocery shopping, even if he brought someone along with him, they would have to show him around and read the labels on cans and packages aloud to him. “It was really difficult to be independent when he went grocery shopping,” Steenhout said. But even if the dream of unassisted shopping was now within the realm of possibility, it had yet to be fully realized. For instance, Steenhout said that online grocery store platforms at the time were still not coded in a way that was compatible with assistive technology, like screen readers. He said there was the promise “dangling in front of my colleague’s face saying, ‘Hey, you could be independent, but we haven’t done it in a way that is actually going to work for you.’” (Peapod announced just last year that its website and app are compliant with the ADA.) “So it was a very interesting dichotomy between the potential of something but poorly implemented meant that that potential wasn’t fulfilled,” Steenhout said. But even if online grocery shopping wasn’t as useful as it is today, a basic access to information was already proving to be a great equalizer to those who previously had to rely on expensive machinery or a sighted confidante. Prior to the web, all kinds of essential information needed to navigate the world existed exclusively on print paper. Stuff like the ingredients in food items, instructions on how to take over-the-counter medication, information on how to vote, and what time the trains were scheduled to arrive. Optical character recognition devices—which can scan print and digitize it, allowing for text-to-speech conversion—already existed, but in the ‘90s, these machines were expensive, scarcely available, and relatively slow. Steenhout, who is also a wheelchair user and doesn’t own a car, relies on public transit, but says it’s largely not wheelchair-friendly. “If the bus has a ramp, nine times out of ten, the ramp is broken or there’s too many people or there’s a push chair in the wheelchair bay,” he said. “You name it, there’s problems out there.” He said for him, “one of the great realizations” was that many services that once required you to physically be at a location are now online. “It was either get on the phone and go through voicemail hell or get on a bus and go into a building and hopefully I was able to find someone that could give me the information I was looking for, so the amount of time required to get to the information or the service was a lot more difficult,” he said. And because a lot of these services were government services, they were only available during traditional business hours, requiring him and others to take time out of their work day to show up. But with the web, and with these government resources now available online, he was able to do the research needed when he got home from work. Andraéa LaVant, a 35-year-old consultant and disability advocate, is also a wheelchair user. 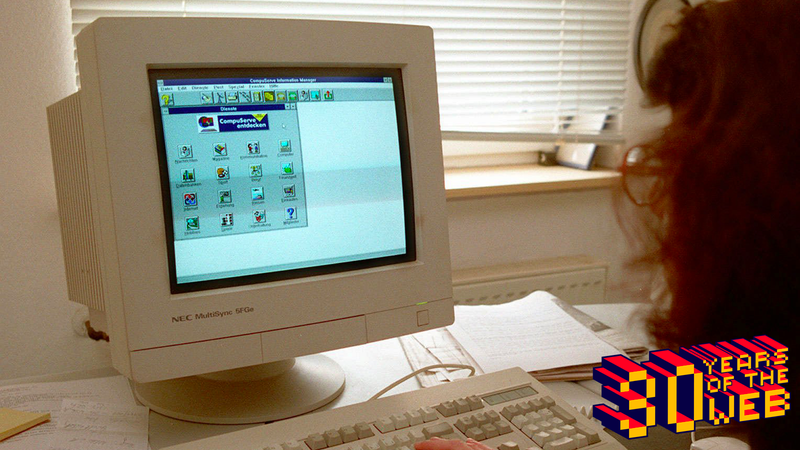 She described herself as growing up in the “pre-ADA generation” without good access to computers or the web until around high school and college. She recently moved to the Phoenix area and said that access to government websites to learn about the details of specific programs, or to fill out applications online—where she can download a program to sign a document and submit it without having to go to the relevant office—wasn’t something readily available to her years ago. “I think back to the days of like having to have access to a printer and having to go to the post office and have stamps and all of those things that, again, for a person with access needs like mine, physical, having to leave the house to do all that kind of stuff can just be a lot,” she said. These days, it can be hard to imagine a time when almost all information had to accessed physically. It’s also hard to imagine a time when, if you were feeling alone in a world of billions, you couldn’t just log on and find community. He said that the first community he found in the early days of the web was an accessibility forum that goes back about 20 years. The web didn’t have the searchability it has today: you couldn’t just type in the right string of words and get thousands of relevant search results. Instead, you bounced around from hyperlink to hyperlink until you ended up in the right place, which is how Steenhout found this forum. Still, some of the web’s potential for people with disabilities remains unfulfilled—and as the internet becomes increasingly central to people’s lives, truly universal design online is more important than ever. “I am still finding issues on websites that I was finding 20 years ago,” Steenhout said. He lists problems with images, font controls, and content hierarchy, all features that can make it nearly impossible for people who use assistive technology to access websites. Linking to a Pew Research study from April of 2017, Wong said that there are “structural, economic, and cultural” barriers that people with disabilities experience on the web to this day. She listed inaccessible websites and apps—a majority of developers still don’t design accessible websites— along with “usage of CAPTCHA, videos without captions, YouTube videos with crappy auto-generated captions, podcasts without transcripts and images without alt text” as aspects of the web that should change. And while making websites more accessible is crucial in itself, these features don’t just help people with disabilities. “Some of the standards and best practices in accessibility for the blind community do make the web better for everyone,” Lauridsen said. A number of mainstream features that have improved the web in general—voice assistants, voice-to-text, and alt text, for example—were originally designed with accessibility in mind. “There’s a whole list of these kinds of things that have had significant impact on society as a whole that originally were there to help people with disabilities and I think that’s something that we tend to forget that is kind of important to mention,” Steenhout said, “because it goes hand in hand with what’s happening on the web at the moment.” He added that he’s not certain why designers and technologists still fail to deploy accessible websites.